the happygirl: smitten: interview and review for "the whale"
smitten: interview and review for "the whale"
In the summer of 1975 “Jaws” scared the bejesus out of me when it was released in theatres. I don’t know what the heck our parents were thinking when they took us little kids to see a movie about a great white shark while on vacation AT THE BEACH but it scarred me as well as every other little kid who screamed and kicked the next day when our parents tried to get us to play in the water at Hampton Beach. Luckily, there is now a happy tale about a whale that makes what lies in the deep blue ocean a whole lot more friendly. This is the story of a happy little orca named Luna that just may become the world’s most beloved little whale. Luna’s story as depicted in “The Whale” begins on a summer day in a fjord called Nootka Sound off the rugged coast of Vancouver Island. One day, like a child in a giant watery department store, this baby whale is inexplicably separated from his family. He does as he was taught. He calls out for his family every day-hopeful- and yet every day he roamed alone in the Sound waiting for his family to come back for him, the echos of his call unanswered. He was alone. It’s here that the true story of this little whale begins. In a move that surprised biologists Luna decided that if his family wasn’t coming back for him then he was going to make his own family. Experienced filmmakers, Suzanne Chisholm and Michael Parfit captured Luna’s story, exploring the relationships between man and animal, offering up the questions- Do animals experience happiness? How do humans and animals coexist in this great big blue world when we can’t communicate with each other? Or can we? Over the course of this little whale’s adventure people came to love this little orca. From a cook on an old freighter to a tough fisheries officer and an elder of a First Nations tribe, Luna affects everyone who encounters him as he is determined to create his own social circle, a family of his very own. Luna “goes to work” with loggers, accompanying them on their day. He goes nose to nose with a barking dog on a boat (each tilting his head at the other as if to say “What exactly are you?”), even playing peek-a-boo with fisheries officers and swimming along with a pod (boats) of his own. Due to his eagerness to “play” with humans, Luna’s story begins to reach beyond those who live in Nootka Sound. Unfortunately for all those who flocked to meet Luna, there were some who wanted to see Luna moved or worse. As Luna starts to interfere with the sea planes landing, the government steps in in the name of helping Luna move on without a human family. Yet, he isn’t about to let anyone get between him and his proxy family. Luna, the happy little whale, finds himself caught between the government, a First Nations tribe and literally everyone else who thinks they know what’s good for Luna. The funny thing is that it was Luna who was in charge. He was determined to build himself a happy family, regardless of the obstacles put in his way. What is there for us to learn from this little whale? With its charismatic and charming lead male, colorful supporting characters, inspiring story and extraordinary cinematography "The Whale" is an uplifting tale and one of my favorite films of the year. It's amazing what can be learned from one little whale. Last week I had a chance to sit down with filmmakers and producers Suzanne Chisholm and Michael Parfit to talk about this determined little whale. 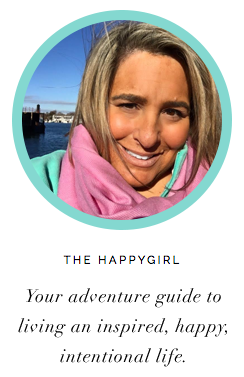 The Happygirl: Michael, Suzanne, the golden rule of journalism is not to get involved in the story. How hard was it to try to maintain this distance between journalist and subject? Suzanne Chisholm: You try not to be part of the story we did eventually get involved. We have done stories in Bosnia and Africa. As journalists you are not supposed to get involved and it can feel cruel in a lot of ways. How can you not get involved? We were in a unique position. People trusted us. We felt that the most important part was getting the information out. Michael Parfit: It was difficult. I believe there is a value in staying apart from a story because what you can provide for the public is such value. One of the critical things for us in telling this story was to describe what we were doing without making the film take that position. We told it as if we were other characters we wanted to be upfront that we were taking this position. All of a sudden we found ourselves in this unique spot. We loved Luna. We cared a huge amount about him. It was a difficult choice. We have been criticized for it but if you make it and you are upfront about it is that is all you can do. HG: People seemed so attached to Luna. Why do you think that is? SC: Most people’s experience with whales is from a distance. You go on a whale watch cruise and you see a little blow in the distance but when you are close the whale looks you in the eye and you recognize that there is a living, breathing, conscious mammal there who has these intricate social needs, behaviors and desires that are very much as complex as those of humans. Different, of course, but you recognize a creature that is not really all that different from ourselves. Many people feel in love with Luna. It is just seeing them up close and also a part of you just sympathizes with his circumstances. I remember sitting on the dock a few days before his capture attempt and seeing him and I am not embarrassed to say this. I just cried for him because here he is separated from his family and we know how social they are and he was living all by himself. How can you not sympathize with a character who has nobody? It tugs at your heartstrings. MP: There was something about him that your empathy was just there. . .If you look at what he looks like, he has no facial expression. He has a little tiny eye and supposedly humans are attracted to big eyed things, right? SC: Big eyed furry things and he is neither of these things. MP: He did things so intentionally. He made up his mind and he did stuff. All these different things he did like stealth whale, you know? Where you would be looking out and wondering “Where did he go? He was way over there.” Then all of a sudden POW! He was right behind you. SC: A lot of people said he had a sense of humor. He would do these things, and elicit these responses where people would laugh so he would continue to do them and he would do them like a kid in a lot of ways. We think about the term anthropomorphism. Are we putting ideas of how we experience things onto an animal? We have done a lot of research in how to describe an animal’s emotions in our film without saying he is just like another human being because he isn’t. There was a connection. We try to address that in the film. Always he was trying to make contact with us. He would come up and make little whistling songs above the water and look at you and it was clear he would try and communicate with us. Old school biologists say that the only the only reason animals do anything is to procreate and feed themselves. Well you see all of these funny behaviors that Luna does which aren’t for these purposes. There was entertainment value for him. HG: What did you learn about happiness from Luna? SC: Our bottom line is that we were happy he was a free orca. We never wanted him to be in a situation where he wasn’t happy. There is something so joyous about when an orca breeches. We don’t know if that means they are happy though. They could just try to be getting away from something in the water. There were also a lot of hopes and desires that we had for Luna to connect with his family. MP: For me one of the things that I think of that makes me relate to happiness in the film was when he was hanging out with Jamie (one of the First Nations tribe.) Luna seemed to be relaxed. He would just lie there calm. You felt as if he was relaxed and happy when he was with Jamie. I think in that sense we could pick out when he was happy. It is a bit like the whole notion of friendship. It is pretty amazing that the concept of happiness is something that a whale might have. That's pretty amazing. How do you ecven cope with that in your own mind? For us going out there and watching him go through what seemed to be a whole range of emotions to realize that these things were somewhat similar to feelings we have but also different in ways. SC: He behaved quite differently toward Jamie. He recognized Jamie. MP: He behaved differently with Jamie than he did with me. He trusted Jamie more than he trusted me. When he came up he would play with me but he would lie there and look at Jamie. To see that is pretty amazing. Jamie had a good connection with him. It’s a mystery. 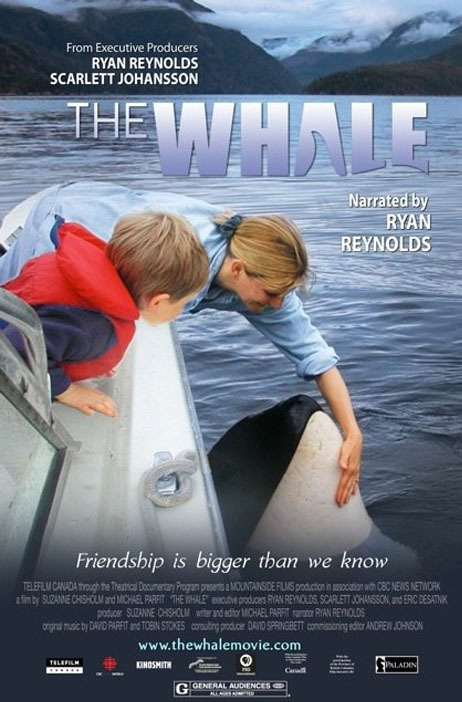 HG: Ryan Reynolds narrated “The Whale.” How did Ryan get involved? SC: Our agent showed it to him and he loved it. Ryan is from Vancouver and he has gone out whale watching as a kid and in all likelihood he had seen Luna’s family. MP: Ryan was wonderful to work with. HG: So Luna did make he own family. SC: We admired that he did the best he could. He didn’t have his own biological family but he carved out the best living that he could for himself. It was an unusual living. One day I saw him and he had blue or rust paint on his chin. He would be rubbing up against the bottom of boats. He did his best to get that stimulation that he would have gotten get from his family otherwise. A lot of things he did with boats he would have done in the wild with his pod. When you see footage of whales swimming close, they are rubbing. They are very tactile animals. He didn’t have any other whales so he did this with boats or people. If we can say this by all appearances he did his best to do what would make him happy or fulfill his own needs. That is not to say that I think we humans were a good substitute. We must have been so one dimensional compared to them. The language is such a big part of their culture. It was as though we were speaking a foreign language but he kept trying. “The Whale” opens in select cities September 9, 2011. Visit http://www.thewhalemovie.com for more information about this very special little whale named Luna.